What does it mean to have a buyer-centric strategy? When it comes to strategy, everyone has an opinion. People will say to you “all you need to do is…” – and that’s your cue to tune out completely. But what should you tune into? 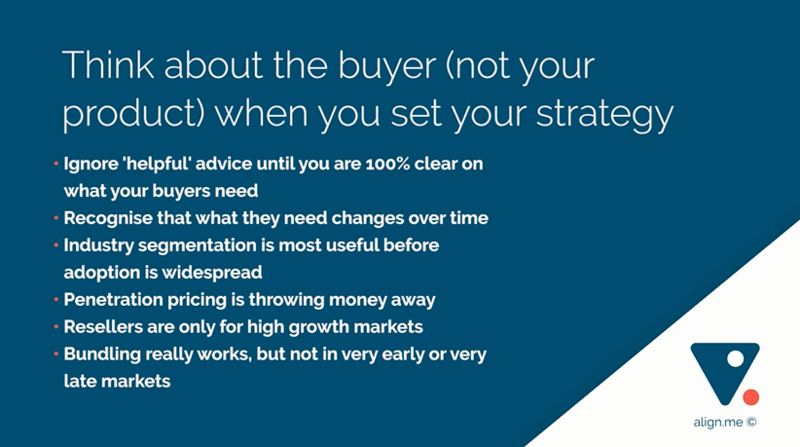 Today, I’ll share a bit of detail around tuning into your buyer’s needs at different points in your product life cycle, as well as some examples of contemporary companies that have made their strategy really buyer-centric. Both the original maturity curve and the technology adoption lifecycle are largely talking about the adoption life cycle. There’s a few in the beginning, a few in the end, and then lots in the middle. So, we know this, but what do we actually do about it? Early adopters – in the beginning they want some kind of advantage in return for taking a risk. 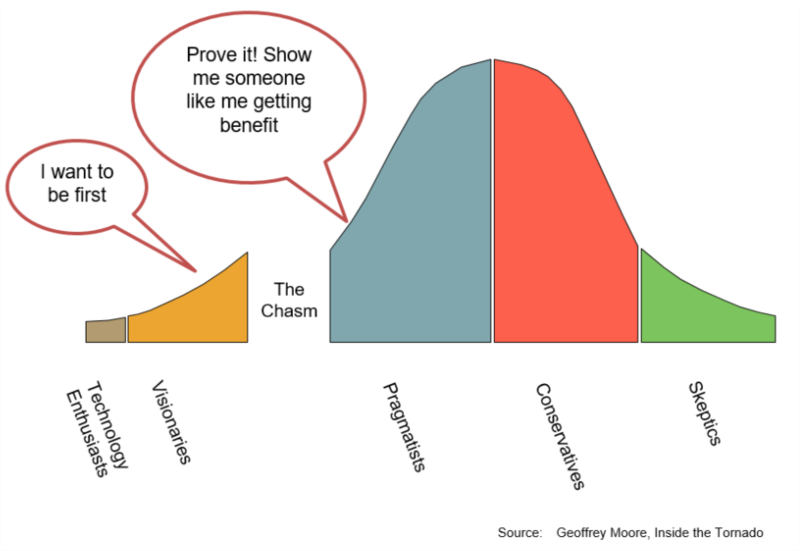 Pragmatists – why doesn’t this group buy at the same time as the early adopters? What’s missing that holds them back? The key is proof; the second group need a little bit of evidence that your product has potential. Conservatives – once the market is really growing, what is this group waiting for? They’re only willing to buy when they see widespread adoption. They’re not super late to the party, but they don’t want to be the first ones to turn up either. Sceptics – once the market has really matured, once it’s peaked, what do these buyers need? Do you think they still really need to be told how to buy? Probably not; they might actually be telling you how they want to buy. The buyer’s need changes, and therefore your buyer-centric strategy has to change. A great idea for one stage in the market might be a particularly silly idea for the next. So we need to know which stage the buyer is in. The very early buyer with the big risk appetite doesn’t really care whether you’ve served anybody else like them. In fact, they’d probably prefer that you weren’t serving somebody like them. They want to be the first one in. It’s that next group who need confidence, and they get confidence from seeing others just like them buying, and that’s the time when industry segmentation or clustering your buyers makes a whole lot of sense. Once the market’s really growing, industry segmentation doesn’t really matter again. That’s why Uber goes city by city. That’s why Stripe – the payment gateway provider – are focusing on developers and not end-user companies. Both are respecting that even big markets need proof. Much later, once the market really maxes out, then it doesn’t really matter so much whether you’ve got enough proof for them – they know that it’s a good idea to buy from you or from somebody else, so industry segmentation has served its purpose. When the market does need proof though, you’ll enjoy more success by focusing on a small number of segments where you can be strong. In a brand new market there’s no competition for you to be compared with, and the buyer doesn’t really care about what it costs you to make your product. What they care about is what value you are going to deliver to them. So for his early market, we don’t need penetration pricing. Later, when the market matures, price and cost might come closer together. But in the early days you’re going for value pricing, not penetration pricing. That’s why Tesla is not in the car business, and not in the battery business. These are mature markets with thin margins. They’re in the sustainable energy business where the margins are great. There’s not enough market yet for the resellers to be attracted to it, so you probably won’t get good resellers interested. The buyer lacks confidence, and so they want to deal directly with the end user. But once the market has reached its high growth phase, that is the ideal time to go through resellers. That’s why Apple sells through both Telcos and retailers. When should you bundle your solution? Bundling (another one of those great ideas that people will tell you to do) really works, but only at a certain stage in the market. In a very early phase of the market you don’t know what to bundle yet. You and the market haven’t worked out what a complete solution is going to look like, so you need to be flexible and be willing to wrap a lot of service around. Bundling won’t work. In a very mature market, buyers want to unbundle, or cherry pick what they want out of the solution package. So, again, bundling won’t be ideal at this stage. In the middle of the product cycle, when the market is a little bit nervous, they want to see the solution as complete as it can be. So this is the stage when it makes sense to bundle. What’s most important is that in a buyer-centric strategy, you don’t focus on your product. That’s why telephone operators let you bring your own device (rather than one specifically from their company), because they recognise that as mature buyers, we start to dictate what the terms will be, what we want, and from whom we want it. All of those big strategy questions: the market, the product, the channel, and the competition, should all be informed by what problem you’re solving, and how mature the market is. 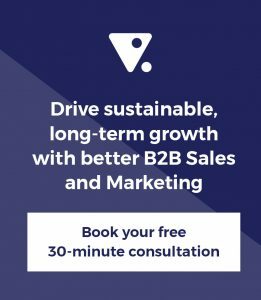 But you need Sales, Marketing, Finance, and Operations to all agree what that buyer-centric strategy should be, and then you need to execute it. That’s why you need tactics—what you’re actually going to do to find buyers, close them, and every step in between. 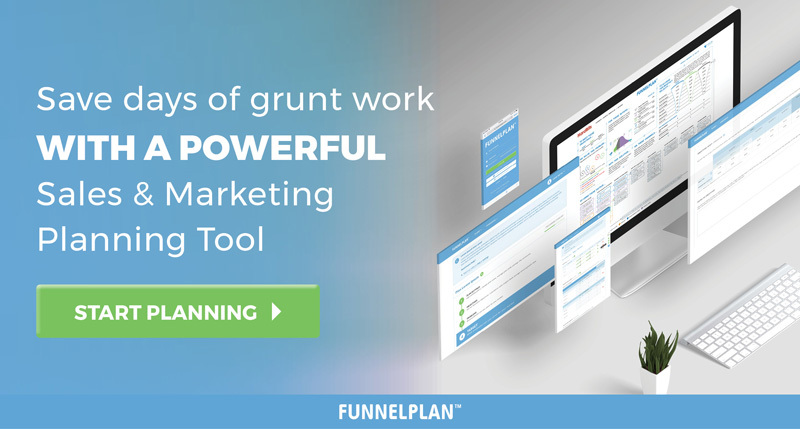 Resolving both the strategy and the tactical questions is the job of a Funnel Plan. It’s a tool to help you answer those questions, all the way through to tactics, and then communicate them. Now if you have a funnel plan already you know exactly what I’m talking about. If you don’t, go get one now at Funnelplan.com.